When a United Airlines flight crew said they wouldn’t make an announcement to passengers that Lianne Mandelbaum’s son, Joshua, would be flying on board with a peanut allergy, they didn’t know who they were messing with. The angered mother found another way home and soon launched a petition on the website Care2 urging airlines to make accommodations for allergic travelers. It seems Mandelbaum has struck a nerve. Her petition has taken off, garnering almost 27,000 signatures so far. She has attracted an impressive amount of media attention, from the likes of The New York Times, Forbes, Yahoo and Condé Nast. She is holding meetings with airlines and lobby groups, working with her state senator’s office and speaking at conferences. 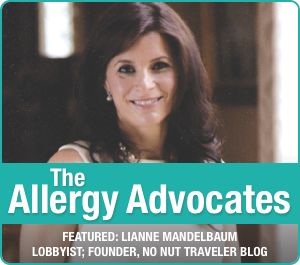 This mother, previously a non-practicing physical therapist who taught exercise classes, has become the food-allergic traveler’s public relations machine.